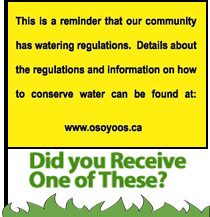 The Town of Osoyoos and Rural Water Districts 8 and 9 are on “Normal” domestic and lawn watering restrictions. These restrictions ensure that the residents of Osoyoos water their lawns on certain days, within a specified time interval. No sprinkling is permitted between the hours of 10 am and 7pm. Over the summer we will be placing yellow flags on properties where lawn watering has been observed outside of the approved date or time. These flags serve as a friendly reminder to educate residents and are not meant to harass or offend property owners/renters. We all have a part to play to conserve water in our community, and we believe these yellow flags are a better option than a ($100) fine.